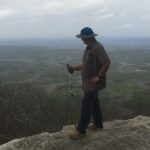 I have been using the HydraPac Stow 1L while overnight backpacking as well as while day hiking for exercise. 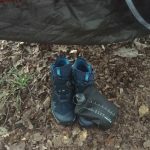 It has worked well but I did find it more difficult to get in and out of the side water bottle pockets on my backpack and from the water bottle pockets on my waist pack or vest. To read the rest of my update please click here. 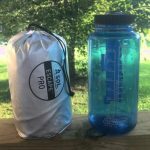 I wanted to establish what I consider the lower limits of the SOL Escape Pro Bivvy. I’m not talking about survival either, just how cold I could manage without risking making myself sick. After testing it down to 36 F I believe I found my limit. Put it this way, I will not be trying it in anything colder than this unless I’m in a true survival situation. On the plus side, I was surprised at just how warm I was able to stay on a very windy and cold night. To read the rest of the update please click here (and scroll down). 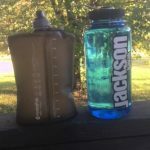 Follow along as I put the new HydraPak Stow 1L bottle through the paces. It is not listed on the Hydrapak website yet and it came without instructions but it’s basically a collapsible water bottle . If I needed instructions on how to use something like this I probably should just stay out of the woods…. to read my Initial Thoughts please click here. I’ll be reviewing the SOL Escape Pro Bivvy for the next few months so follow along to see how it fairs as part of my sleep kit. 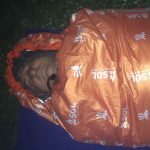 In a nutshell the SOL Escape Pro Bivvy is a stand alone 50 F sleeping bag or it will add 15 F warmth to a sleeping bag. It is waterproof but said to be highly breathable. Testing will reveal how it actually performs. To read my initial thoughts please click here. I kept putting off my final update thinking I might somehow tear or damage the Thunderbolt jeans. Boy, what a waste of time. So without and fanfare I present my final thoughts on what has turned out to be just an outstanding article of clothing. But to read the details you must click here. 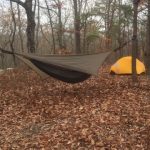 I used the Slumberjack Lapland 20 F on a 3 day 2 night trip along the Pinhoti Trail in east central Alabama. It turned out to be rather warm for January but I managed to get the bag wet. Did I mention we saw some storms… Anyways, the sleeping bag performed nicely, even when wet. To read the rest of the update please click here.